At a restaurant recently when the girls climbed into the neighboring booth to play games on this student's phone. Last month we were at a restaurant celebrating Juliana's birthday with friends. The adults were sitting at one table while the kids (four 3-6 year olds) were sitting at another table. After a while their coloring and giggling and eating pizza turned to crawling under the table playing hide and seek. 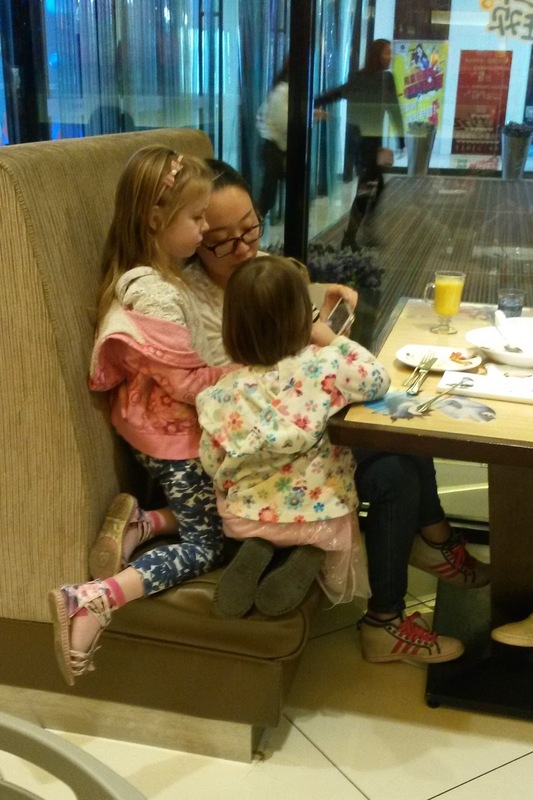 The few others in the restaurant looked on indulgently, smiling when the kids encroached on their personal space (which they probably don't realize is a thing). You don't have to keep an eye on your kids every minute when they are outside at the park or in the neighborhood. In fact, I've seen a number of unattended 5-6 year olds playing near our home. There is much more of a communal feel – there are always aunties and grandmas around to keep an eye on things, and everyone is more or less familiar with their (hundreds and hundreds of) neighbors. 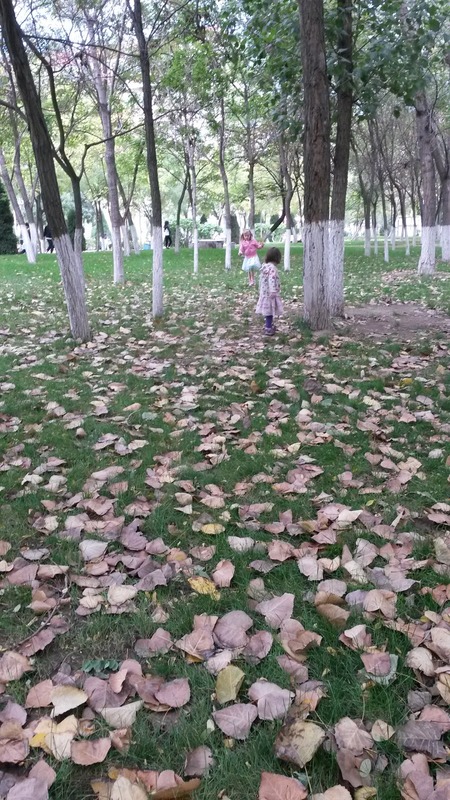 In general, I feel like my kids are honestly safer in China. There are no practice lock-downs at school. There also isn't such a culture of fear here - people just don't seem to worry about sunscreen or the wrong kind of bed killing their child. Restaurants are naturally noisy environments, so if your kids are making noise nobody cares. If they run off and play with the owners' kid or explore behind the counter, it's just to be expected. If they get overly friendly with the people at the next table, checking out their food, they will probably get a lot of smiles and possibly candy. If the restaurant is slow, the waitress might offer to hold your baby while you eat (so long as you don't mind her being shown off to everyone in the restaurant). If your child starts throwing the standard supermarket fit, instead of casting disapproving looks, strangers are more likely to do whatever they can to cheer up the poor child. (Any disapproving looks would be from your failure to give the darling whatever they want). Potty training is a lot easier when it's totally acceptable to squat your toddler by the nearest tree. There are a lot of fun things for kids to do. For $1.50 you can spend hours in a bounce castle at the nearby park. There are indoor and outdoor play areas (though very few free playgrounds). Our city has a free kid-friendly science museum, a kiddie beach, and a park with a carousel, train, and the standard tank ride. Your kids can almost always find playmates outside. It helps to have hundreds of neighbors in a few acre radius. Grandparents spend a lot of time outside with their little toddlers, and school children congregate outside at the end of the day. The in-home childcare rate is around $3-4/hour. I hardly ever take all the kids to the supermarket. In fact, I only go to the supermarket about once a month, since most essentials can be gotten from small shops nearby. We even have old-fashioned fresh milk delivery two days a week! Your kids have visited multiple countries, taken hundreds of flights, napped on the back of an elephant...all before starting school. Bouncing around in a little electric cart or sitting on the back of a bike is much more interesting than riding in a car. You can see the scenery much more clearly and really enjoy those fun speed bumps. One of the official duties of grandparents (students, friends, random strangers...) is to pass out candy to any child around. You often refer to the world map when talking about where various friends live. You realized that people around the world have very different perspectives on parenting. Here, everyone sleeps with their babies/children and putting your baby in another room sounds horrifying. They also rarely use diapers, would never give a baby cold (room temperature) water, and don't put kids to bed until late at night. People do things differently, and shockingly, it all works out. So perhaps there is more than one right way after all. Nadia has now reached the point where she has been alive on the outside longer than on the inside. Actually, since she was born early she already passed that point, but close enough. I was reading a blog I wrote about Juliana at 9 months old and it was interesting to see where they are both at. No surprise – Juliana was talking more and more enthusiastic about every single thing in life. What was a surprise was to realize that Juliana, my classically bad sleeper, was actually sleeping much better than Nadia at this point. It was a very depressing realization. Juliana and Adalyn were such diametrically opposed personalities, I'm still not quite sure where Nadia fits. I think she is somewhere in the middle. 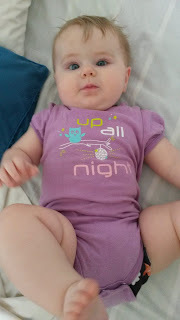 She is generally pretty quiet; just in the last couple of weeks she has started babbling “ba-ba-ba.” Of course she has so much noise and constant activity around her, that's not too surprising. She is usually happy and ready to play. Juliana was much more focused on communication than on movement. Adalyn was pretty content to hang out and observe (until she learned to climb). Nadia likes to watch her sisters play, but she is happiest when she can be involved. She likes to play Little People or play food or My Little Ponies – they all make excellent chew toys. In the past couple of weeks she has started crawling everywhere and pulling herself up. Both of these activities have greatly increased her enjoyment in life. She can now bang cabinet doors, search out pieces of paper to eat, chew on shoes, pull things down from pantry shelves, and get into all of her sister's toys. She loves to eat and has eaten anything we have offered and some things we haven't (yummy floor crumbs). I'm still making a lot of purees for her, but she also likes scrambled eggs and some pieces of the food we eat. She likes to lap water out of a cup as well. She nurses frequently but has a hard time focusing during the day – there are always so many interesting things going on! She still nurses very frequently throughout the night though. Dearest mama, I am so distressed to cause you such terrible nights. I will be sure to sleep better from now on. About the night...yes, it's pretty terrible. Honestly the good nights are the ones when she sleeps for 2 hours at a time. Occasionally she will sleep for 2.5 hours, but I can't remember when she last slept longer than that. Months ago. A lot of nights she wakes up every hour or two, and some nights she struggles to settle down for half of the night. I don't know what her deal is. At some point we'll try something else, but since my previous sleep improvement attempts have come to naught, I'm not feeling very motivated. Pick me up, or I will eat you up! She is definitely going through an attached to mama phase. That is, she is always been attached to mama, as most babies are. I realized recently she had never actually had a bottle, as she has never been away from me for more than about three hours, day or night. But lately she is extra happy to see me and sad when I callously abandon her. If I come back and don't immediately come show her how much I missed her, she is heartbroken. She likes to play peek-a-boo and smiles when she hears her name. She has discovered the joys of banging toys on the tile floor and knocking down block towers. She enjoys tickles, going upside down, and looking in the mirror. I'm not sure who she looks like. My mom says she looks like I did as a baby. She looks similar to Juliana, although I noted that Juliana was still wearing some 3-6 month clothes while Nadia has mostly moved on to 12 month size. Her bright blue eyes and blond hair draw a lot comments of “好心疼!” (More or less “she makes your heart ache!”). She is a very sweet baby and those chubby cheeks get many kisses a day. Nadia is taking a rare long nap, the 2 hour kind that only happen when I am planning to go somewhere. I need to buy some more bread for lunch, to support our daily PB&J habit. Our ayi is at our home this morning, so I decide to just take the girls. After a few rounds of “put your socks on or else,” we head down the stairs. The sky is gray – not “factory town” gray but “blustery autumn” gray. Despite the absence of any visible sun, the girls don pink Hello Kitty and racer flame sunglasses. We have good sandwich bread available at our nearby campus shop, so the girls climb on scooters and balance bikes to ride through campus. People watch us everywhere we go, something I almost forget about it has become so normal. Students kindly dodge out of the way of swerving children with cries of “How cute! The little foreign dolls!” When we walk in the store the shop ladies and shopping students all smile indulgently. They no longer blink when we pile 5 packages of bread onto the counter, (about the equivalent of one loaf). They already know the crazy foreigners apparently live on bread alone. 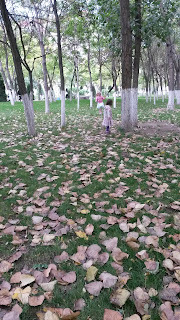 We need to get back home, but the girls want to stop in the little copse of trees to find some leaves. I often hurry them along, driven by my own relentless internal clock, but today we pause. Maybe it is the crispness in the wind, or the autumn sky, or the sight of yellowing leaves, but I want to stop and soak in this moment when I am actually enjoying life instead of slogging through it. We delight in yellow leaves in perfect heart shape and shudder at strange wiggly mushrooms. The girls fill the scooter basket with leaves and dandelions. Just as the wind blows the sun clear in the sky we walk and scooter and bike back home. Nadia has just woken up from her nap and greets us with sleepy eyes. Adalyn grabs her hands and makes silly faces. Juliana finds a play milk bottle for the flowers and sits down to make leaf rubbings. I settle in to nurse Nadia. For this moment, no one is whining or screaming. The world pauses to appreciate the first tastes of Autumn. I heard once that babies could sleep through the night from a few months old, and before I had babies I thought that meant babies did sleep through the night from a few months old. I also was under the impression that once babies started sleeping obviously they kept sleeping, and that surely no preschooler/kindergartener/elementary school child would still have trouble waking up during the night. Let us pause to laugh at my naivety. Enter Juliana. That child did not sleep. It was a struggle to get her to sleep every single time. She popped awake at the slightest provocation (like if you breathed too hard). She woke up a ridiculous number of times a night and thought 3am was a great time for a party. She wouldn't nap unless we held her. For like, forever. She first slept through the night at a year old, and that was very short lived. Soon we once again up with her for an hour or two every night. Around 18 months she finally started sleeping consistently. Adalyn was our sleeper. I remember setting her down, patting her gently for 30 seconds, and she was out. At two months old she was routinely sleeping 6-7 hours at a time. She had her regressions, but overall everything just came easier to her. Let the record show it's not just me; I really did have one good sleeper. When Nadia was born I had pretty realistic expectations. I also felt pretty confident that I wouldn't have another sleeper as bad as Juliana. That just wouldn't be fair, and everyone knows that life is fair. Nadia started out like your average newborn. Around 3 months she even had a brief spell of 5 hour stretches. Then that 4 month sleep regression hit and she never got over it. For most of the past 5 months, she has been waking up every 2 hours. Sometimes she'll sleep for 3 hours (not recently) often for 1 hour (recently), but there hasn't been any improvement. It's not that we haven't tried. By 4.5 months, when the whole regression thing didn't seem to be going anywhere, I pulled out my No Cry Sleep Solution book and started going through the various ideas. Nadia kept getting sick, and that didn't help our progress, but I thought surely if we kept working at it we'd see results. We finally got in a full month of working hard on sleep...and it had only gotten worse. 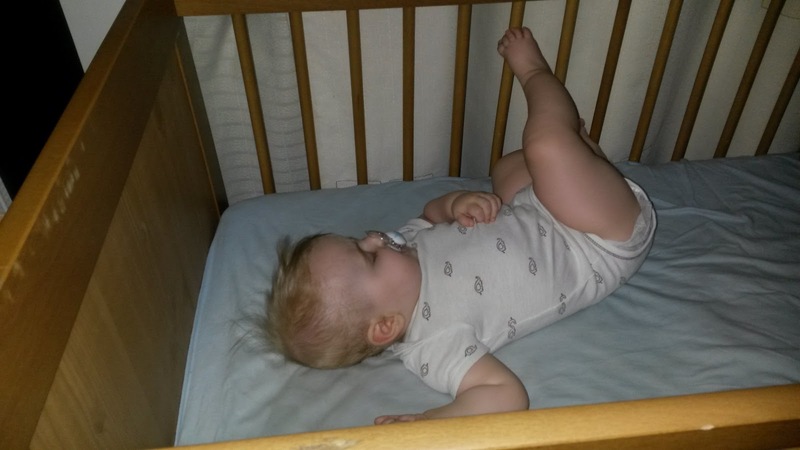 I have tried co-sleeping. I like the idea a lot, but practically it hasn't worked well for us right now. Nadia is restless; I sleep fitfully and wake up with a sore back. I was barely functional and starting to lose the will to live, so at 7+ months we decided to try “cry it out.” I was adamantly, ethically opposed to CIO when Juliana was a baby. I have mellowed on most of my stances since then, but I still don't like leaving a baby to cry. I think there is a reason it feels so unnatural. But I felt like it was the right decision at the time, as what was going on obviously wasn't working. I still nursed Nadia once a night, but the other times Kevin went in to her. 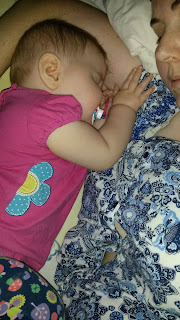 I wasn't even expecting her to sleep through the night – I was just hoping to get to something more workable. But after more than two weeks, Nadia was still either waking up frequently or having a long crying spell. I thought the point of CIO was that they cry and then they start sleeping and stop crying every night. That wasn't happening. As soon as we quit, Nadia went back to waking up every two hours. So I quit trying. I'm out of plans, and even if I had plans, I'd be too tired to implement them. Do you know how hard it is to be disciplined and think clearly at 3am when you've already been woken up 2-3 times? I have stopped expecting it to get better because it doesn't. I nurse Nadia back to sleep because that's the easiest, and not nursing her back to sleep was hard and took a long time and didn't actually help. For now, I will be tired. Fortunately I have long since forgotten what it's like to get decent sleep so I don't quite know what I'm missing, except a fair number of brain cells. But in the tiredness I have a choice. I can either be bitter and frustrated and complain all the time (which I do sometimes), or I can accept it. I can recognize that I have survived the past five months and I'll probably continue to survive. 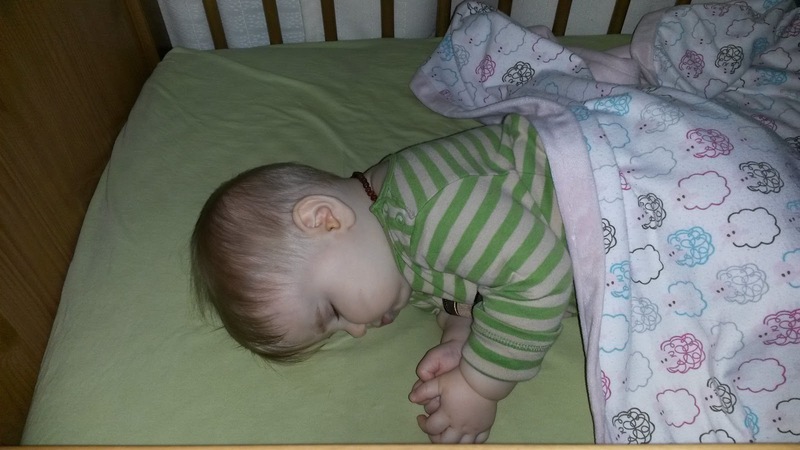 A friend recently brought up an idea from a book she was reading about viewing these night wakings as “calls to worship.” (If anyone else said something all spiritual like this, I would not take it well, but this friend is a mom to five little ones and has had her fair share of poor sleepers. She hasn't just been there; she is there – and that makes all the difference.) What if being up all night with your baby is actually a form of worship? A keeping of the night watch? It certainly isn't a natural response. It's easily a drudgery to get through, bleery eyed and barely awake. It's easy to resent the sleeping household (the whole world is sleeping except me! 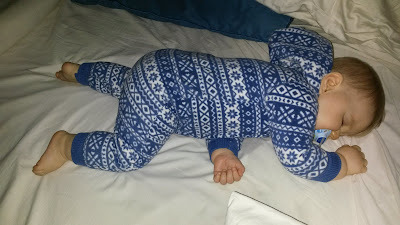 ), to resent those other people with the babies who sleep (where did they get them??). It's easy to long for this stage to be over and for Sleeping Through the Night to commence. It requires refocusing every single time. Every hour or two, all night long. But when I stop complaining, I realize this is an invitation to communion. In the quiet of the night, this is a holy place. I may not have a lot of brain function, but I can consciously turn my heart toward God. I can choose to worship, to meditate, to offer a sacrifice of praise. In the midst of physical exhaustion, I can believe that I will find rest for my soul. There remains a rest that only he can give. If I choose to receive it -- There is grace for the night, joy in the morning, and strength for the day. They say the church fathers gave us fixed-hour prayer, but now I know the church mothers marked sacred time long before these hours had names like lauds, sext, vespers, compline, matins, and the office of the night watch. Mamas have been keeping watch for as long as God has cooed and whimpered and shrieked through a baby’s tiny lungs every hour…every two hours…or, if you’re lucky, every three. In those hazy hours before dawn, I think about the practices of caring for a baby. How simple, yet how laborious they can be. How feeding, diapering, and comforting a newborn fill every hour of every day...I’ve been thinking about how these simple acts can be spiritual practices.